We had a great time @ our cousin's home yesterday. Lil' Evan is soo cute and I enjoyed snuggling with him the whole time we were there....such a Sweetie!! 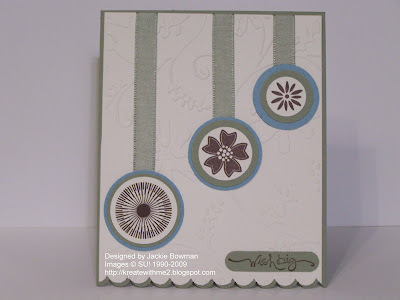 My first card for today is featuring The Color Throwdown challenge to use Baja Breeze, Very Vanilla & Mellow Moss. I added Chocolate Chip ink to level out the rest of the colors....hope that's not considered cheating! This card also features Taylor's Cupcake Challenge---I didn't use cupcakes this time either but it still qualifies!!!!! This lil' guy is for the Color Challenge on SCS to use Pumpkin Pie, Brilliant Blue and Garden Green.....what was Emily thinking LOL!! I really struggled to find *something* to help work these colors and that's when I remembered this ss Boatloads of Love. It all came together after that including my layout.....not bad hugh?!! Thanks so much for stopping by and have a great rest of the day! Love them both. Taylored Expressions sketch you did is beautiful and the boat is fabulous. I hated that color combo myself. Amazing though how great the submissions all turned out. Great job - and a happy Sunday. Jackie, I think your idea of using chocolate chip was a winning idea! It really does balance out the colors! Love this layout and the scalloped edge at the bottom! Oh these are great Jackie!! Love them!! I love both of these cards, Jackie!! Thanks for sharing. I just checked out your link for the Color Throwdown Challenge, that one looks like fun and I'll have to try it. Enjoy your Sunday, hope it's a nice relaxing day for you! Your cousin has a great taste in names . . . *wink*. I'm glad you had a good time. These cards are so cute. I love the bright colors on the boat one. On the first i like especially the different flowers and the second one is a fabulous boys or mens card. Jackie your cards are both adorable!! Love the vigrant color on the second card, so perfect for a boy's card. And I love the simplicity of the first card. Gives it a very elegant look. Wow, both cards are great! I love the way you used the CTD colors with Taylor's sketch, and I didn't even attempt the other color challenge, but you did a great job with! Thanks for playing the CTD! Love the first card. I's so pretty and I love those colors together. The color challenge this week was tough. Your card came out cute. Wow, great design on your CTD challenge card! It's reallly pretty and adding Choc chip is not cheating! The little guy card is adorable too! Both are great and oh so different. The first is simple and elegant and the tug boat is so cute, really like the puffs of smoke coming from the smoke stack. Great job on the color combo! Hi Jackie, Great job on the color challenges for both cards. I think the Boatload of love card is fabulous. Sooo cute! Your color throwdown card is such a classic. Love those clean lines. BTW, I think CC is a neutral, don't you? Very cute cards, Jackie!! I have awarded you with The One Lovely Blog Award....congrats!! Jackie, I am giving you an award for "One Lovely Blog"! Your blog is wonderful and want you to know it! Cute card - way to make that color combination work! Love the blog - and love all the links to the challenges. I'm new to blogging and new to challenges so there's are a lot for me to check out here. Thanks for taking the time to put it together! Great job on both cards! Using Chocolate Chip was just fine--love the medallions you used. Thanks for playing the Throwdown! Hi Jackie! Both of your cards are so cute! I love how you combined the Color Throwdown and Taylor's sketch! Great cards! Thanks for playing! Love your layout & colors in the first card! Very calming! Love both cards...but that first one with the mellow moss...Wow! My kinda colors! Totally cute, Jackie! Love both of your cards! Thanks for playing the sketch challenge! 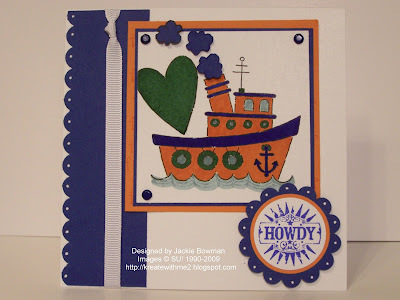 What adorable cards, Jackie...I love what you did with Taylor's sketch and that little tug boat is super cute....such AWESOME work!!! Great cards! I love how you used Taylor's sketch with the Throwdown colors! And the tugboat card is so cute, and I say anyone who tackled that color challenge last week is very brave! Hello Jackie...I have finally made it over here to check out your blog. I have seen you have somehow wandered over to mine! Love your work. I wanted to say congrats with all the awards!!!!!!!!! LOVE the Boatload card... layout, dimensional smoke puffs... everything!